Most men are guilty of doing this. When we confront them they typically say it’s all our fault. We don’t have those breasts that chick has. We don’t dress like supermodels. We don’t like heels. We don’t have wavy, long hair. We’re not as slim as Jessica Alba. Guys always have something to say. If your partner looks at other girls wherever you go, it’s a red flag. While my best advice is to run away from him, you probably love him and want your relationship to keep going. Healthy relationships are built on mutual trust and respect. If your guy looks at other girls, he shows his disrespect for you. Here’s what you can do to stop him from looking at other chicks. 1. Are you looking for a new girlfriend? If you often catch your guy looking at other girls, don’t keep silent and don’t look for your own flaws. Be more confident, but not furious. Don’t show your emotions. Let him know that you are smarter than him. Next time he can’t stop staring at that girl, ask him a few questions like, “Is she hot?” “Are you looking for a new girlfriend? Can I help you” or “Are you stupid enough to check other chicks while I’m still here?” This will hopefully help you descend him to earth and make him feel ashamed for his behavior. Now it’s time to have a serious talk with your partner. First, let him know how you feel when he’s ogling other girls. Of course, you feel disrespected, uncomfortable and unwanted. Second, find out the reason. What’s he looking for? Tell him that he should control himself and get rid of this habit if he wants to be with you. He should know that you won’t allow him to treat you like a pile of rubbish. More: Are You Dating a Womanizer? If all those talks are in vain, mirror his behavior. Just for once. Look at some guy and make sure your boyfriend notices that. Sure, it’s not the smartest way out, but he will at least know how it’s when the person you love ogles every guy/girl they meet. If he tells you that you have no right to do that while he can, say goodbye to him and move on. You’ll definitely find the one who will be looking at you only. Every girl is beautiful in her own way. We are all different. Love yourself and overcome your fears and insecurities. Comparing yourself to other girls won’t help you solve the problem. You will only ruin your self-esteem and let your guy walk all over you. Guys respect confident girls. When you love yourself for who you are, your partner does the same. If he doesn’t, break up with him. You don’t need anyone to point out your flaws. You know what you need to fix and what can’t be fixed without anyone’s help. Instead of moaning about how miserable you are, start improving yourself. Do it for yourself, not him. Fall in love with yourself. Know your worth. Enhance your beauty. Improve your posture, body language and speaking skills. Once your boyfriend notices all those changes, he may stop noticing other girls, because you’ll become the best example of femininity. When you’re comfortable with yourself, there’s no room for jealousy. Jealousy can affect your life in a negative way. It can lead to a number of mental disorders including anxiety and depression. But the point is, you don’t know exactly why your partner keeps looking at other girls. Maybe he just wants to make you jealous. When your guy sees he can’t achieve this goal, he stops ogling other girls. 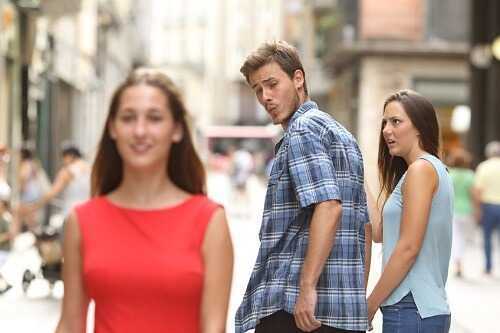 Every guy looks at other girls. He does it secretly. If your boyfriend does it when you are together, it’s a real challenge. The main thing to remember is not to lose yourself. Control your emotions and figure out if your relationship has future. Staying in an unhealthy relationship is a big mistake. It’s better to be single than with a guy that keeps ruining your personality and overall life.